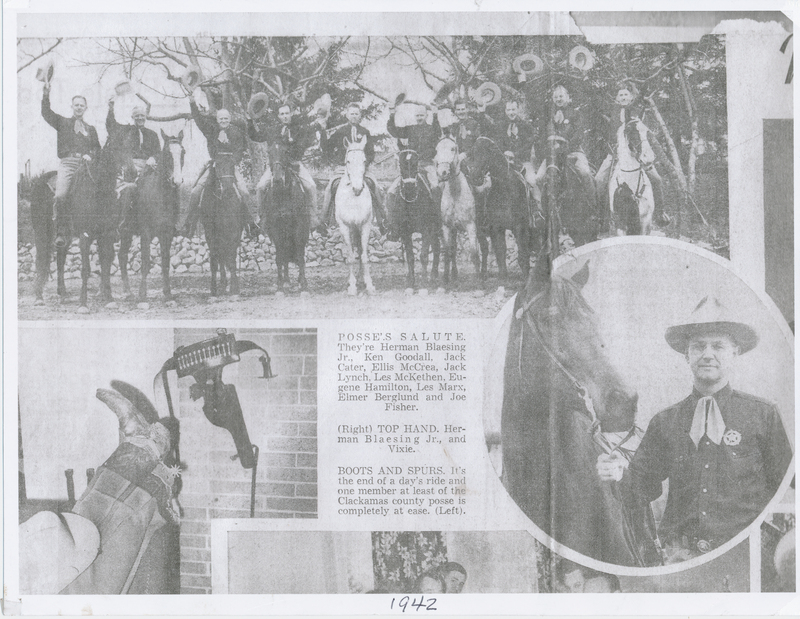 Description Scan and print of original photo or news clipping. Courtesy of Lake Oswego Hunt. Caption reads: POSSE'S SALUTE. They're Herman Blaesing Jr., Ken Goodall, Jack Cater, Ellis McCrea, Jack Lynch, Les McKethen, Eugene Hamilton, Les Marx, Elmer Berglund and Joe Fisher. ; (Right) TOP HAND. Herman Blaesing Jr., and Vixie. ; BOOTS AND SPURS. It's the end of a day's ride and one member at least of the Clackamas county posse is completely at ease. (Left).